BBC NEWS | Have Your Say | Are GP advanced bookings a problem? Are GP advanced bookings a problem? Are you unhappy with advanced access to GP services? A survey by the government watchdog, the Healthcare Commission, suggests that nearly a third of patients are unable to make an appointment to see their GP more than two days in advance. The poll of 117,000 patients found the majority were happy with services, but some complained that government targets to see people within two days have led to surgeries restricting advance appointments. Tony Blair pledged during the election campaign to investigate the problem. What's your reaction to the Healthcare Commission's findings? Do you think targets help or hinder? Have you had difficulty making an advanced booking? Send us your comments and experiences. This debate is now closed. Please read a selection of your comments below. I wonder if they even realise how awkward this is for anyone who has a job? My GP won't do advance appointments at all. You have to phone between 8:30am and 9am and ask for one on the day you want to go, which means, for me, having to phone in to work saying I'll be late as I work 20 miles from where I live and until recently was reliant on once-an-hour train service to get there usually they just bark a time at you and you have to turn up, no matter how inconvenient it is. When it's routine stuff it would be nice to have even 24 hours notice so I can sort it out with the office rather than having to phone in at the last minute and possibly end up having to take half a day or more off. Then, it's lucky if the appointment actually happens on time, I've easily waited 30-60minutes nearly every time as they always run late! I wonder if they even realise how awkward this is for anyone who has a job? It happens at my local GP. You are no longer allowed to book appointments in advance at a time convenient for you, you have to call in the morning to be seen later that day. This means I have to take a day off work for non-essential appointments where previously I would have got a booking well in advance that didn't require time off. So in a small way UK plc suffers. I don't blame my GP for this, though. This perverse outcome is a classic example of what happens when the centre over-regulates and micro-manages. I don't understand the problem - you need to see a doctor when you are ill - how can you know that you are going to be ill more than 2 days in advance? I can't believe some of the trivial whining on this board ! Some people seem to believe that GPs should prioritise appointments around people's domestic and social responsibilities ! They do and should prioritise appointments on the basis of clinical need - just be grateful that you have a high quality free health service - most of the world do not and stop whining about having to make phone calls or having to take time off work (shock horror, how traumatic for you!) Which is more important your health or your job? I find it infuriating whenever I ask for an appointment to see my GP because I have to go through a barrage of questions which concludes with "do you work?" I find it ridiculous that I have to justify my working day just so that I might be lucky enough to get an appointment in 4 days time! It's insulting. This problem could be solved immediately if patients were to act responsibly and only ask to see a doctor if they really need one. I have been to a GP once in the last 22 years - and I don't think of myself as particularly healthy. If I have a minor health problem it will usually be something I can deal with myself, or it will just get better on its own. Pharmacists and the NHS Direct service can also be helpful if you are not sure what to do. Leave GPs to those who really need them - one day it could be you. 48 hours? During my last phone call to the GP I was told no appointments available for the next week! Until recently I was a practice manager. The problem is that PCTs and some GPs have (sometimes deliberately) misinterpreted the target. 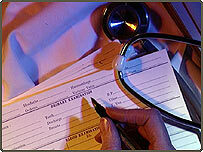 There is nothing in the guidelines that states a GP cannot offer advanced booking. These decisions are taken by the individual practice. Also patients sometimes have unreasonable expectations. One patient arrived at the surgery at 08.45 and was offered an appointment at 09.30 the same morning and then complained that we didn't have anything sooner!! Think yourselves lucky you have got a doctor. I needed a doctor for the first time in over 10 years and I was told that I "wasn't in any surgery's catchment area" So they'd send me some forms to fill in, I could post them back and they'd assign me to a local surgery... by post, obviously. I was better before I got any forms. Seemed like the best plan!! We have had the 48 hour targets imposed on us, without asking patients or GPs what they need or want! I'm a GP: this does not surprise me! We have had the 48 hour targets imposed on us, without asking patients or GPs what they need or want! We are trying to offer some pre-bookables, but we still have to meet the 48 hour targets too! More and more work is being moved from hospitals to primary care: without more doctors and nurses (i.e. more funding for staff) we cannot hope to provide a decent service for everyone! I think that being able to book on the day you need the appointment has been a good change. Many times I have needed to see the doctor as soon as possible that even waiting a day would be too long. If I do have a problem which can wait a week then my surgery has no problems making an advance appointment for me (usually within a week). I don't know how it works in other surgeries but this system definitely works for me and i hope it stays that way. The only people to have gained from the latest GP Contract are the GP's themselves who are paid a lot more for doing less. They are manipulating the 48 hour rule to their own advantage and yet provide less for the patients. Make the slightest moan and they will de-register you. We now spend more per head than any other country on our health services; we have had a vast increase in the number of GPs, who are the highest paid in the world (all strange but true) and what do we hear? More money needed, more doctors, more ... more ... more .. I don't try to go to a GP any more, I just go and sit in A & E and wait. I never have a problem getting an appointment with the doctor. What I do have a problem with is getting a proper diagnosis! In Bolton we have an NHS drop-in centre, you can go there if you can't get in to see your GP. I recently had tonsillitis, couldn't get in to see my GP until the next day, so went to the drop in centre. I was seen within 30 minutes by a well qualified nurse. Also, I tend to see my Practice Nurse at my doctors surgery, she can do nearly everything my GP can and with hardly any waiting time. You can't blame the GPs for this. If it wasn't for the idiotic targets that are being set by the government then this wouldn't be happening. They have to remember that Doctors will try to make the figures work for them, rather like this government will try to put a positive spin on bad news stories. This issue was raised in the 'Leaders Question Time Special' shortly before the general election. I remember an extremely sweaty Mr Blair being dumfounded by this, and he promised to sort it out - presumably it's still going on if we are discussing it here today. About time the government did something about it really! They've had four months since that programme and still no action - what a surprise!! I can only make an appointment with my GP on that morning. Call up on the morning and partake of the telephone lottery to see if I can get an appointment, if not then better luck tomorrow. No forward bookings at all. Unfortunately this means that I have to stay at home to call to see if I can get an appointment and be late for work whatever happens. When I was in Leeds there was an open surgery for 2 hours in the morning and an hour in the afternoon. The rest of the time it was pre-booked appointments which were also easy to get. Surely it's not that complicated? I rang my doctor today for a non-emergency appointment for my 13 year old son and was given one for 4.30 this afternoon. I've never ever had a problem getting an appointment, the doctors are excellent and the receptionists charming! No, it's not private and I'm not telling you where it is or you'll all join the practice! I guess its just a lottery really. I have recently just reached 50 and received a letter from my local primary care trust inviting me to go for a health check (part of the heart and stroke prevention campaign) these are given every 5 years. On phoning my doctors practice to make an appointment I was told the nurses were very busy and short staffed due to holidays, I accepted there advice to ring back in 2 weeks. I rang the surgery a couple of weeks later and this time was told the clinic was fully booked for 4 weeks and thereafter the program was finished. I knew I was not going to get an appointment, but what was more annoying was I was also given similar excuses 5 years ago when asked to make an appointment then. I am convinced that this is just a public relations exercise to make the health authorities look good. What short memories people have! I remember - only a few years ago - when a routine doctor's appointment would often have to be made 10-12 days in advance. Now I can see a doctor in 2 days. There are some silly things in the current policies, but give credit where it is due, the NHS is now much more responsive than it used to be. My view, I think supported by the other comments, is that this is a practice management problem. I have always been able to make appointments up to 1 month in advance, and if I need to see a doctor urgently, I have always been able to within a day. This is usually not my own doctor, but if it really is an emergency, what does that matter. I live in Scotland and have to book an appointment 1 week in advance to see my GP. So lucky those down south who only have to book 3 days in advance. I have complained to my GP's practice manager verbally and in writing all to no avail. The NHS is a joke. I am a GPs receptionist and I feel that patients do not realise that we do not make the rules. If we do not have appointments to offer it is not our fault. The surgery I work in does offer pre bookable appointments up to 2 weeks in advance, I think it is a much fairer system. Please don't blame the receptionist, they are only doing a job of work like other people, and we do not deserve the publicity that we get. If they can do it why can't others? My doctor's surgery not only has an appointment system but they also have at least one open surgery a day when you can go and wait and you will be seen. It is not unusual to arrive at 8.15 in the morning and be at work by 9.a.m. I also made an appointment 6 weeks in advance without any problem. If they can do it why can't others? Being fortunate not to have had to see my GP for over nine years. I'm horrified to read the comments of my fellow readers. I'm getting on a bit now and would be more likely to know that if I required a GP appointment or visit, I would get one before I expire. Recently we took our son to the doctors - the doctor asked us to come back in 7 days. His receptionist refused to make the booking so we could avoid school hours. 5 days later we spent 30 minutes on the phone trying to get through and then had no option but to take a school hours appointment. Simply ludicrous. I'd say so. I had an infected cyst in my ear which needed treatment but I had to book an appointment at least 7 days in advance. By the time it actually came round to my appointment, my cyst had cleared up, rendering the appointment pointless. My elderly father has a long term and serious health problem needs to visit the doctor every 2 weeks or so. His doctor sees him and says make an appointment for a week Friday. Impossible - the reception staff and presumably the practice manager will simply not do it. The tail wagging the dog? Think yourselves most fortunate that you can see a doctor within a week, as in Canada 4 weeks to 12 weeks to see your doctor is not uncommon. Mostly if you are in need, one has to go to emergency were one finds a room full of people waiting for the same thing. We have had to accept that this is the way things are for now, as it is out of our control. Neither governments or doctors have much control over doctor shortages. We need more GPs, but GP friends tell me how difficult (and expensive) it is to get into an established general practice. It's easier becoming a hospital doctor. Unless you're obliged to see the doctor at his request, for routine vaccinations, baby checkups and screenings - we should all go private and have health insurance, as in the USA, or pay in advance and reclaim the costs later, as they do in France. That system would soon winnow out the large numbers of people who clog up surgeries with no good reason. At present, if we want to go private, we need a referral from our GP, which comes very low in the list of priorities, even though we are forced to 'bribe' the GP with thirty pounds (there really is no other word for it), just to write a letter. It's scandalous. The last time I needed an appointment with my doctor I was told I would have to wait a week, or call back in the morning. So I took the next day off work, called at 830 and was seen at 1050. It's clear that the government hasn't got a clue about management, as it's common knowledge that what is measured gets improved even if that isn't the desired effect. My local doctor surgery in Wood Green is a shambles. If i call up - the usual waiting time is 4/5 days. If it is urgent we are directed to the nearest hospital. The surgery is run-down, under-staffed and the Doctor I see there tells everyone to just go to A & E. Totally unacceptable. The nurse there also breached my patient confidentiality. My last doctor in Brixton was spotless, spacious and I could get in within 24 hours every time. Am trying very hard not to get ill so I don't have to be messed around and insulted again. I have been unable to book an appointment unless it's two years from now! In my job I am constantly on the phone and it's proved impossible as you are on hold for 10 minutes waiting. Then you are given an after hours appointment anyway. All you needed was to pick up your prescription. Why do I pay my taxes again? I can get an appointment at the vet any time I want. I have great difficulty getting to see the doctor. The only difference is that there is a charge for seeing the vet. My GP Surgery seems to operate this system without difficulty. When my family needs to be seen, we get an appointment the same day. When we make an advance appointment for routine stuff that is also easily accommodated. In my opinion the problem isn't the policy, but how come some practices are applying it? I work for the NHS and I believe that this booking issue is something which needs to be resolved because it impacts on other services. Many people can't get that appointment with the doctor and so take themselves to A&E instead - because you have to be seen in A&E. This then reflects on the waiting times for A&E. Walk in centres are a relatively new and unknown service which should, if properly implemented and advertised, help rectify this problem. Being given a target is a very reasonable way of trying to improve performance, however this should not be to the disadvantage of the patient. Advanced bookings should still be a main option, but with penalties for not attending/failing to cancel. When I can find a surgery taking on patients, I'll let you know. I am sick of people on here saying doctor's receptionists are rude and abrupt. My wife is a receptionist and the number of patients who are rude to her both on the phone and in the surgery is disgusting. I find if you speak nicely and calmly to people they reciprocate. Our practice can make urgent appointments within 24 hours and will accept longer term bookings, however when I recently tried to make a non-urgent appointment I was offered a date 22 days later! They criticise patients for missing appointments, however it is a regular occurrence that the doctors don't arrive until well after the time of the first appointment that has been booked. Far worse however is the total lack of NHS dentistry, I am faced with a bill of nearly £1000 for essential treatment that I am forced to have privately because of a lack of NHS dentists who will take on new patients. I find my local booking arrangements highly annoying. The only time I have needed to see a doctor over the last 3 years is for my annual appointment to check my contraception. I have tell my boss in advance that I may be at the doctors on a certain day and cross my fingers that I'll get an appointment on that particular day when I phone up. The receptionists are rude, abrupt and frankly, nosey. Although my GP is lovely and once I get past the gatekeepers I have no complaints! I just wish there was a service where you could book two weeks in advance for routine appointments. It would make life so much easier for us workers! Why are we penalised in this way? I find the system of not being able to book in advance the most frustrating system ever. It is not user friendly and would like it changed as urgently as possible. I understand that some people need to see their GPs within 48 hours, but there are usually emergency slots held for these situations. If you do try to book an appointment, but don't manage to telephone first thing, then the 48 hour slots go and you have to wait another day - very unsatisfactory! Why are we penalised in this way? As a GP, I have found the 48-hour target to be a ludicrously simplistic idea; we offer a range of appointments, but find it hard to keep waiting times down and having to keep appointments free 'just in case' does result in us having quiet days when demand is slack - then everyone rings in the next day! The government were told at the outset that this was a poor idea. The underlying problem is that too many appointments are wanted, and insufficient GP's exist. The fact that around 10% of booked appointments are missed makes this worse. We do not have a problem with NHS but cannot find a dentist who will treat me. Our only choice is to go private which we cannot afford. My wife has recently undergone cancer treatment which increases her risk of tooth decay! Last week I telephoned my medical centre and requested an routine appointment to see either of the two doctors I normally see and they said the first appointment would be 18 days time. Why doesn't the government stop imposing ridiculous targets and strategies on GPs and let them get on with what they trained for? If they didn't have quite so many bits of paper to fill in justifying every one of their actions then they'd have time to see a lot more patients. My doctor's surgery offers a triage system. We can talk to a doctor on the phone within an hour who assesses whether or not we need to see someone that day. Short term appointments are not a problem and if you have a regular appointment with the same doctor about a continuing health problem then the doctor can make appointments that override the two week barrier. The surgery is organised, efficient and has few complaints. I have never been able to get an appointment with my GP within 48 hours! I usually have to wait for 2 - 3 weeks (I'm not exaggerating). This means that if I have something that needs urgent attention I have to go to a walk-in centre. The system really needs to change - it's a nightmare! I'm a student and at my GPs students are not allowed to make an appointment with a doctor. We are forced to attend surgeries held by nurses a couple of times a week without an appointment and only get to see a doctor if the nurse thinks it is necessary. This was even true when I rang up after having visited A & E after an asthma attack and thy had told me to visit the doctor the next day, as well as not being allowed to make an appointment there was no student surgery that day either. Students it sometimes seems are second class citizens not entitled to proper healthcare. Although I can see the need for a 2 day response, there are also a significant number of people whose issue is not urgent and need to arrange time off work to see the doctor. Unless they can book an appointment a week in advance they will be unable to obtain the medical help they may need. When we first moved into the area you could book appointments in advance, then it all changed and you now have to phone the surgery on the day that you want to see the doctor. This is not very helpful when you have to arrange time off work especially when you have to go for regular check ups. I find the present GP appointments system much more agreeable than previously, when unless you went to an emergency surgery, you would have to wait at least a week to see a doctor. Now, you can call in the morning and see a doctor that very day. There are many ailments that would not warrant "emergency status" but that can't wait a week to be sorted, and the 48 hour system is the most effective way to deal with these. I appreciate, however, that the present system does restrict advanced bookings. Access to a GP is a lottery. Cannot book an appointment until the day you require it. No calls allowed before 8am then you end up in a queuing system. Standards when you finally get to see your doctor is excellent. I am a GP. I physically cannot provide more appointments than I do. The government can set as many targets as it likes and change the "rules" regarding access however the problem is lack of appointments and the only way to provide more appointments is to provide more GP's. The country is 10,000 GPs short (a problem the government has known about for years) and it is difficult or impossible to recruit new partners or locum doctors to stand in when I cannot be in the surgery. I can never get an appointment with my GP. You have to phone on the day that you want an appointment. I always phone at 8.30 (as soon as they open) and the phones lines are either engaged or ring off. When you finally get to speak to someone they say there are no appointments for the day. The receptionists are always rude and abrupt. When I do actually get to see my GP the service is excellent, however, it is a frustrating process and I am seriously considering changing surgeries. To see the more popular doctors you have to wait at least a week at my Health centre, but you can usually see the less popular ones within 48 hours even if it does mean going through the triage nurse first(a process that really annoys me!). When I asked why it took so long to get an appointment I was told we hadn't enough doctors to cope with the new housing that has gone up in the last few years. I note that my taxes and contributions have not been altered to reflect this problem!